One of Greece's most renowned contemporary composers, Thanos Mikroutsikos, will dedicate three concerts to the 100 years of the Communist Party of Greece. The concerts will take place in the country's three largest cities, Athens, Thessaloniki and Patras and will contain compositions from Mikroutsikos' 50 years career span. 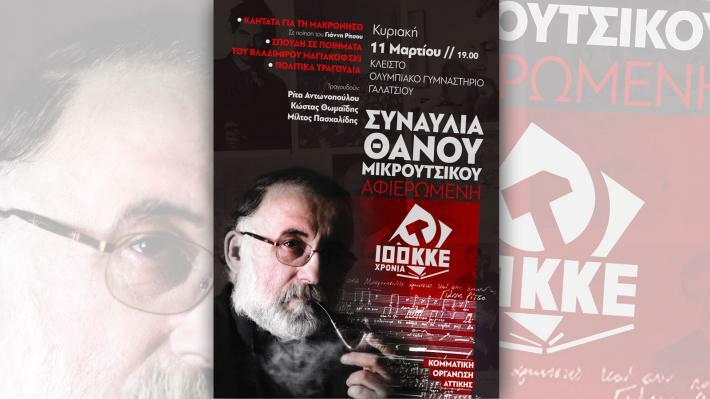 The first concert will take place on Sunday 11th March at the indoor Olympic Hall in Galatsi, Athens, where the General Secretary of the CC of the KKE Dimitris Koutsoumbas will deliver a keynote speech. Thanos Mikroutsikos will be accompanied by singers Miltos Paschalidis, Rita Antonopoulou and Kostas Thomaidis. The first part of the concert will include Mikroutsikos' work "Study in poems of Vladimir Mayakovsky" performed by Kostas Thomaidis, as well as the composition "Cantata for Makronisos" with poetry written by Yannis Ritsos. The second part will include various political songs written by Mikroutsikos based on poems by Nazim Hikmet, Bertolt Brecht, Alkis Alkeos, Kostas Tripolitis, Wolf Biermann, Fondas Ladis, Odysseas Ioannou and others. The concert in Patras (Indoor Hall "Dimitrios Tofalos) will be held on March 23th and the respective one in Thessaloniki (Palais de Sports) on April 1st.